Place oats in a pan. Roast oats for 2 - 3 minutes. Cool and grind in a mixer. Set this aside. Place broccoli in boiling water for 1-2 minutes, then remove with a slotted spoon. Place them in ice cold water. Reserve the water. Keep few broccoli aside to be used later as garnish. In a blender, grind broccoli. Heat oil in a pan. Saute garlic and onion. Add ground broccoli, reserved broccoli, and blanched broccoli florets. Now add milk, sweetcorn, salt, pepper, grounds oats dissolved in 1/2 cup of water. Simmer for 5 minutes. When it is done, serve hot. This soup provides you with all the health benefits from vegetables. Here vegetables are pressure cooked and pureed in a blender. The addition of oregano provides a nice flavour and the oats gives thickness to the soup. Heat oil in a pressure cooker. Saute cloves, peppercorn,onion, garlic, dried oregano. Add beetroot, carrot and tomatoes. Mix well. Now add 4 cups of water. Pressure cook for 5 - 6 whistles. Allow it to cool and then puree it using a blender. Add powdered oats soaked in 1/2 cup of water. Add pepper and salt. Simmer for 5 minutes. Serve hot with a squeeze of lemon. The goodness of flaxseed and parsley with a burst of flavors from veggies and dressing makes it a super healthy salad. This salad is especially good for people on a diabetic diet. High fiber in flaxseed makes it an excellent seed to manage constipation. High in antioxidants and omega-3 fatty acids. Good for skin and haircare. Good for people with anemia and to treat urinary tract infections. Soak flaxseed for 15 minutes in water and drain. Keep this aside. 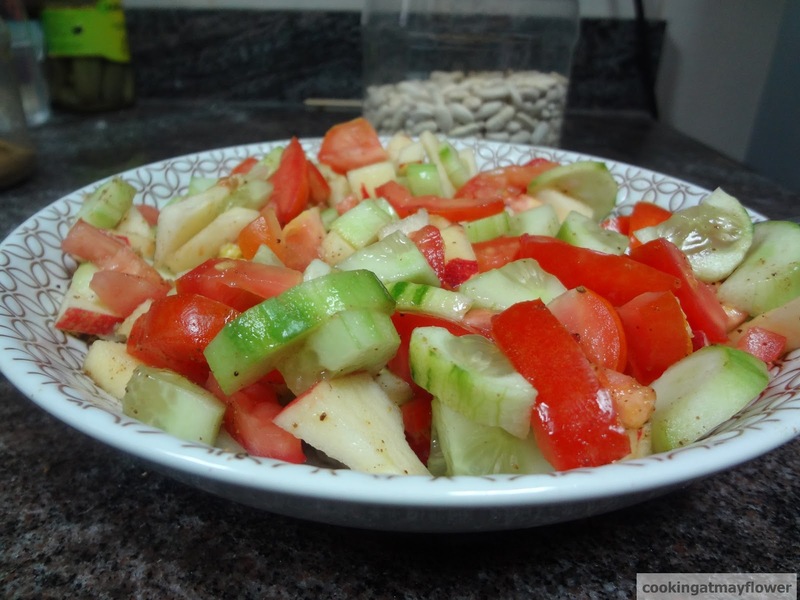 Cut cucumber, carrot and tomato in square pieces. Add chopped parsley. In a bowl, add cucumber, carrot, tomato, parsley and flaxseed. Now add the salad dressing. Mix well. Serve chilled. A healthy twist on the regular coleslaw with the addition of more yogurt and less mayonnaise. This is a good source of vitamin C and are ideal for kids. Top it on your cutlets, sandwich between burger buns and you are in for a crunchy treat. Mix mayonnaise, yogurt, dijon mustard, apple cider vinegar and honey in a bowl. Set this dressing aside. Tip all the vegetables in a bowl. Pour the above dressing and stir well. If you have leftover coleslaw, keep in an airtight container for upto 3 days. In a bowl, add sliced onion and salt. Mix together with your hands and squeeze out onion juice from it. This helps to remove some heat from the onions. Now add green chillies and vinegar. Add salt if necessary. Combine well and serve with meat cutlets, chicken cutlets, or fish cutlets. Combine cucumber, avocado, spring onions, ginger, coriander leaves and lemon juice in a bowl. Using a blender, blend them in batches. Add enough water to get desired consistency to form a chunky soup. Season to taste with sugar, salt and pepper. Place this in the refrigerator to chill for 2 hours. Serve with a dollop of yogurt and toasted sesame seeds. Peel and grate raw papaya and raw mango. Grate the coconut. Mix papaya, mango, coconut, green chillies, curry leaves and salt. First, you have to make a really flavorful chicken stock. If you are interested in making quick homemade chicken stock, you can check my how to make a pressure cooker chicken stock? it is very easy and gives a rich flavorful stock devoid of MSGs. Next, you have to pick light soy sauce over dark soy sauce. Light soy sauce is lighter in color and saltier. So it does the work of keeping your soup not turning dark. Last, cornflour, beaten eggs, and a strainer to get that perfect floating egg shreds. Make chicken stock by adding water, chicken bones, carrots, celery, green beans, garlic, onion, peppercorns, and bay leaves. Strain once or twice to get a more clear chicken stock. In a pan, add chicken stock and sweetcorn. Bring it to a boil. Add cooked chicken and salt. Mix cornflour with 1/2 cup of water and add to the soup. Cook for 3 minutes in low flame. Now the soup is thickened. Pour beaten eggs through a strainer on top of the boiling soup. Continuously stir so that the eggs passed through the strainer do not go lumpy.Add light soya sauce. Mix well. Now add vinegar and sugar. Stir well. Add pepper powder. Taste check for salt. Add salt only if required as we are adding light soya sauce, which is more saltier than the dark soya sauce. Garnish with spring onion leaves or celery leaves if required. Cook macaroni with water and salt. Once cooked, drain water, and set aside. Hard boil the eggs. Once cooked, cut into 4 pieces. Set aside. Mix mayonnaise, crushed peppercorns, and salt. Set aside. Toss macaroni and chopped celery. Add mayo-peppercorn mixture set aside. Mix well. Decorate a salad bowl with lettuce leaves, transfer the prepared salad on to of the leaves. Decorate with julienned red bell pepper and eggs on top. 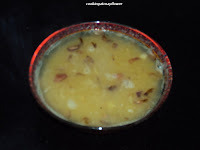 This oil free soup works well for people on diet. Red peppers - 4 Nos. Insert the red peppers on a skewer. Roast the red peppers on stovetop until the skin is black. Remove the pepper from flame and immediately using a kitchen towel rub the skin off. Discard all the stalks, cores, white pith and scrape out the seeds. Chop the roasted pepper roughly. Set aside. Heat 2/3 cup of vegetable stock, onion and garlic in a large saucepan. Boil until the onion has softened. Sprinkle rice flour and rest of the vegetable stock. Add roughly chopped roasted peppers and bring to the boil. Simmer for 5 minutes. Leave to cool slightly, then puree it in a blender. Season to taste with salt and ground black pepper. Return to the saucepan and reheat the soup.
. 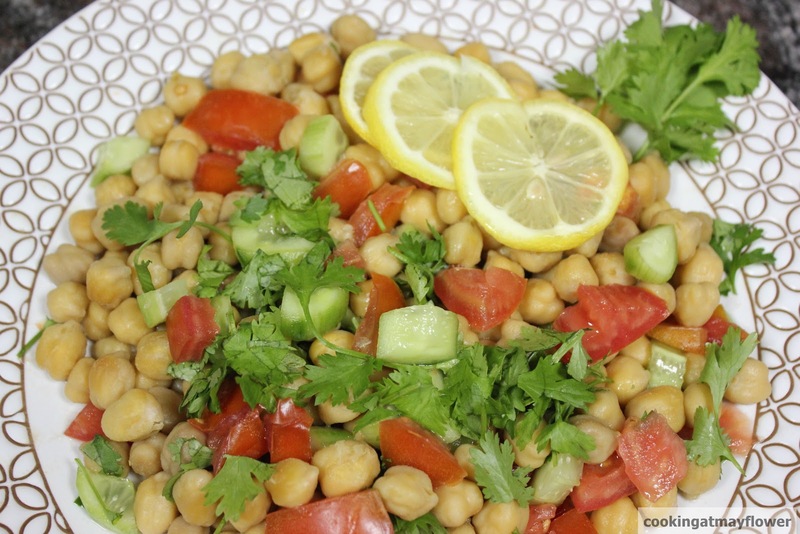 Mix boiled chickpeas, boiled kidney beans, green beans boiled, red bell pepper and celery. In a small jar, add olive oil, vinegar, onion, salt and pepper. Shake well. Pour over the beans. Mix well. Keep this refrigerated for at least 3-4 hrs before use. Cook chicken breast pieces with salt and pepper powder. Cut them into small square pieces. Place the stock cube in a pan, add some water and allow it to dissolve thoroughly. Cook sphagetti in water and keep aside. Heat butter and olive oil in a pan, saute onion and garlic. Once it is sauteed well, add broccoli. When it is cooked, switch off the stove. Pour this to a blender along with the chicken stock prepared above. Puree this in a blender. Now bring back the pureed mixture along with the set aside chicken pieces to a boil and add cooked sphagetti. Once the soup is hot, serve hot. Linking this to Divya pramil's Christmas event. This salad is very refreshing. Good for dieters as a full meal too. 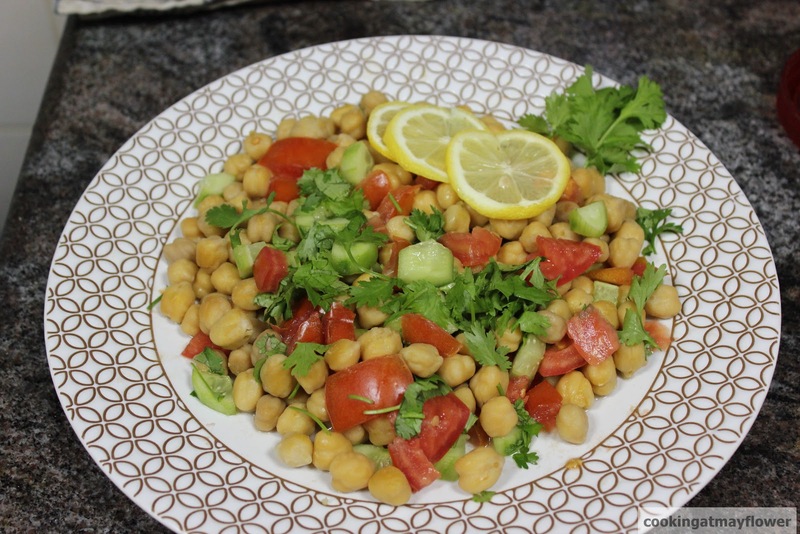 Soak chickpeas overnight. 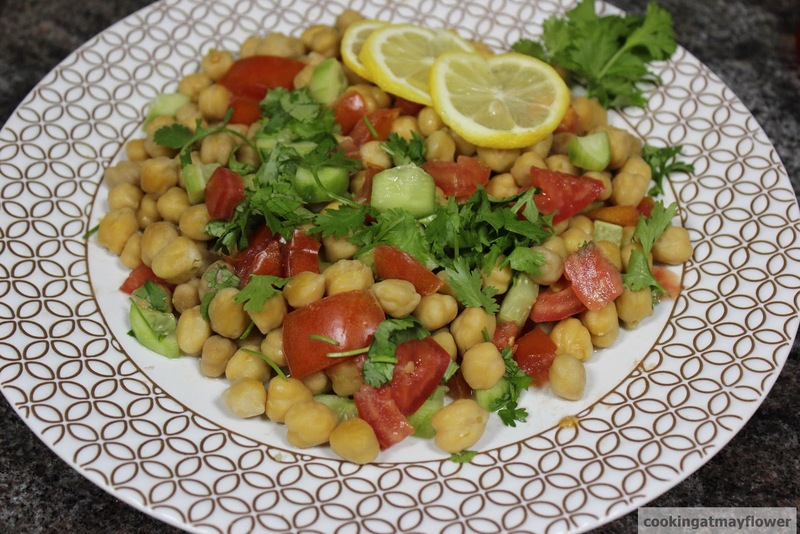 Pressure cook chickpeas till 3-4 whistles. 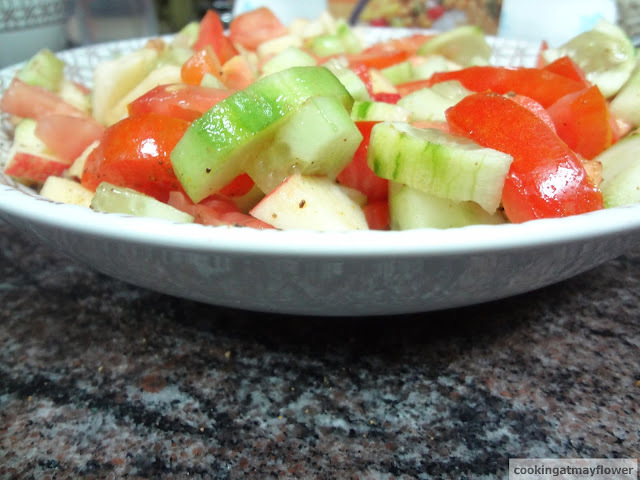 Chop cucumber, tomato, and coriander leaves. Pour salad dressing and serve. This recipe is good for postpartum care. Fenugreek has anti-inflammatory properties and is widely used in the treatment of back pain. Wash and soak uluva overnight. Cook this in the soaked water. Strain excess water. Add grated coconut and jaggery. 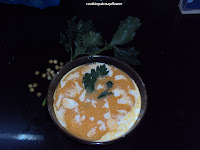 Serve uluva salad. Chop apple, tomato, cucumber, and green chillies. 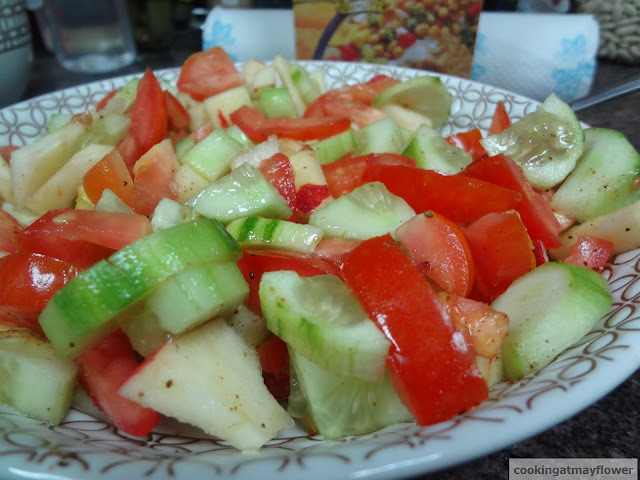 Dress the salad with salt, lime juice, olive oil, sugar, and chat masala. This is a very refreshing salad perfect for a salad meal.